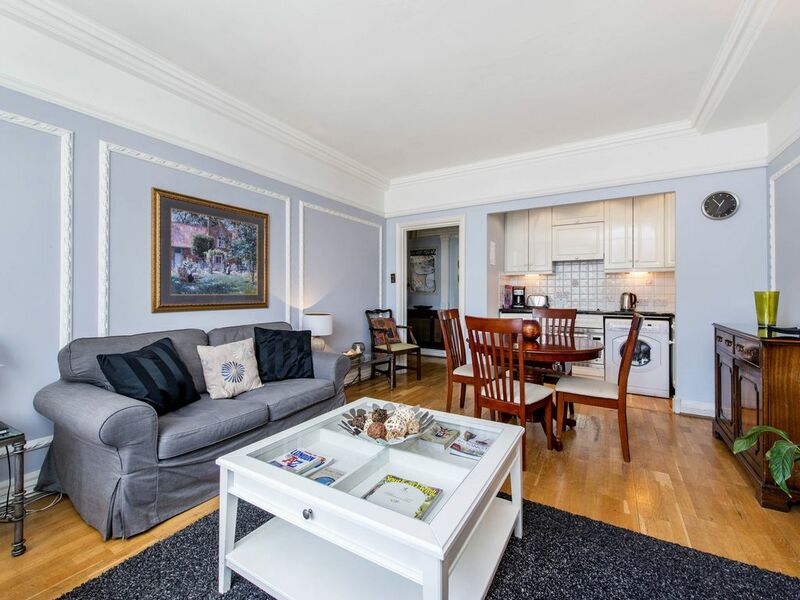 This flat is in the heart of St. James's, directly across the street from every major private club in London, with St. James's Park just through the block. Marlborough House, Buckingham Palace, Clarence House, Her Majesty's Theatre, Trafalgar Square, Waterloo Place, and Carlton Terrace are within 2-3 minutes from this accommodation. Piccadilly Circus is just up the street. This is an ideal location. The property itself is in an 1837 stone building, completed in the year Queen Victoria came to the throne. It is in wonderful condition and is smart and filled with atmosphere everywhere. The flat is on the 4th floor with a small PRIVATE LIFT to the property. There is a mirrored entrance hall with polished wood floors. The LIVING ROOM is large with a beautiful window, comfortable seating, decorative fireplace, and a DINING room table. The KITCHEN is built in to the north end of the room. The kitchen has a washer/dryer, convection oven/microwave, electric hob, and refrigerator. The kitchen area is absolutely new and has just been redone to a good standard. The MASTER BEDROOM has a UK Super King size bed and is very quiet because the room has double glazing. It is a lovely, large bed. The SECOND BEDROOM has two single beds. The BATHROOM has a shower over the tub, wash hand basin, and loo. This property is ideal for clients wanting to be in the heart of it all. It is so convenient. You can walk to the National Gallery in five minutes. The standard of the property is excellent, but the location is simply amazing. High speed wireless internet is included along with Cable/satellite TV. Property is designated non-smoking. This flat is conveniently located near the Piccadilly Circus underground (a direct route from Heathrow Airport). You can walk to multiple underground stops, Buckingham Palace, Churchill war rooms, and Parliment (among many other attractions). If you are a runner - it’s an easy 3-4 mile loop to and around Hyde Park. The flat itself was also nice. It had practically everything you need - including a adapter plug. There was an iron, multiple blow dryers, fans, and all kitchen items you need. The grocery store (Tesco) was only 2 blocks away. We would totally recommend this place to anyone coming to London! Thank you very much for your review! We're glad to hear that you enjoyed the convenient location of the property as well as the amenities provided. The property was very nice, everything we needed to enjoy our time in London. The location was perfect, close to a tube station, shopping and restaurants. Would highly recommend! Thank you very much for your review! We are happy to hear that you enjoyed the property and its great location and appreciate your recommendation. This flat in London was perfect. I accompanied my husband to London while he attended business during the week. This flat was perfect. Warm. Cozy. Homey. Great Location. Couldn't have asked for a better place to enjoy shopping, restaurants, sites. All easy to walk to or an easy ride from Piccadilly Circus station -a 5-7 minute walk. Thank you very much for your review! We are happy to hear that you enjoyed the great location and comfort of the property. Wonderfully situated. We loved it. I would stay there again in a heartbeat. There are a few items of concern. The old windows cannot be locked in the closed position, although there are modern inner windows that can. We happened to be there on nights with high winds, and the windows flew wide then slammed shut at intervals throughout the night. And the outer gate doorlock jammed on us late one night. We had left our contact numbers in the apartment and had to spend a long time in the cold wind working to unstick it. But the place was really nice for all that. Modern enough to be comfortable, cranky enough to let you know it had been through history long before you were born. Our hostess was very nice, put up with our constant changes in arrival times with a smile, and made us feel really welcome. She took the time to explain everything and arranged our transport to the airport. And the place was spotless with plenty of linen on hand. Thank you very much for your review. We will have our London management check on the windows as well as the outer gate to address those concerns, thank you for letting us know. We're glad that you were pleased with the property, as well as the service you received, and do hope you will return to stay with us again. Wonderful location very central to most attractions. Flat very clean. Loved the convenience of plugs for electronics. Ricardo explainations clear. Tips and suggestions helpful. We were able to walk to most attractions. Driver to airport friendly and prompt. Thank you very much for your review. We're glad that you were pleased with the convenient location of the property as well as the service you received from our London staff. We hope you will return to stay with us again! The accommodations were perfect for our small crew. The train stations were close and whether walking up to a show in Piccadilly or cruising to catch the changing of the guard at Buckingham this flat was ideal. It’s right in the middle of the heart of London! Thank you for your comments. We're glad to hear that you had a wonderful time in London and enjoyed your stay at the property! private club in London, with St. James's Park just through the block. Piccadilly Circus is just up the street. This is an ideal location. The property itself is in an 1837 stone building, completed in the year Queen Victoria came to the throne. It is in wonderful condition and is smart and filled with atmosphere everywhere.